Markets posted another winning week as quarterly earnings continued to beat expectations and Q2 GDP hit a four-year high. With roughly half of the S&P 500 having reported, second quarter earnings are now projected to rise 22.60%, up from last week’s estimate of 22.00%. In economic news, the first estimate of U.S. Q2 GDP showed the economy expanded at a 4.10% rate in the quarter, which served to more than offset weakness in housing as both new and existing home sales continued their summer slump. For the week, the Dow Jones Industrial Average added 1.57%. Economic growth surged to 4.10% in the second quarter, the economy’s third-best growth rate since 2009. First quarter GDP also got a boost with the Commerce Department revising the reading up to 2.20% from a previously reported 2.00%. Consumer, business, and government spending all contributed to GDP during the quarter, up 4.00%, 7.30%, and 3.50%, respectively. Considering the ongoing trade disputes, it was no surprise to see exports rise 9.30% as businesses rushed orders out to beat the tariff deadlines. The GDP report is encouraging as consumer momentum appears to be strong as we head into the all-important back-to-school and holiday shopping seasons. Existing home sales fell for the third consecutive month in June, down -0.60% to 5.38 million units. Year-over-year (yoy), sales were down -2.20% as a shortage of properties on the market pushed up prices and sidelined home buyers. The strong housing market served to entice homeowners to put their homes on the market, pushing inventory up 0.50% yoy to 1.95 million units. That was the first year-over-year increase since June 2015. Despite the rise in inventory, supply still remained tight at 4.3 months. That is well below the six-to-seven-month supply that is considered to strike a healthy balance between supply and demand. As a result of the tight supply, the median home price rose 5.20% from year ago levels to $276,900 in June. That was the 76th consecutive month of year-over-year price gains. New home sales also fell in June, pressured by rising material costs and continued shortages of land and labor. Sales fell -5.30% to a seasonally adjusted annual rate of 631,000 in June, their slowest pace in 8 months. Year-over-year, sales were up 2.40%, their slowest rate since October. The drop in sales served to push the median new home sales price down -4.20% yoy to $302,100. The decline was due in part to a drop in sales in the West, a typically more expensive region. On a positive note, inventory rose to a 5.7-month supply in June. Thus far, the economy has been able to buck the weakness in the housing market as the drop in sales has been driven mainly by a lack of supply rather than a lack of demand. Higher inventory combined with some price relief for home buyers should help provide support for the housing market. Markets continued their rise this week, fueled by strong corporate earnings and U.S. GDP. Investors remain optimistic the strong economic momentum from the second quarter will carry through the second half of the year. The third and fourth quarters have historically been two of the biggest quarters for consumer spending with back-to-school and the holiday shopping seasons. In addition, GDP should get a boost from a resolution of the recent tariff disputes, with the U.S. just this week moving closer to striking a deal with the EU. Continued economic momentum, combined with a resolution to the tariff disputes, could help push U.S. GDP to the elusive 3.00% level this year. It’s a big week for markets with the Federal Reserve holding its Federal Open Market Committee Meeting. In economic news, nonfarm payrolls and manufacturing figures are set to be released. This week, Probity Advisors, Inc. is happy to share some exciting news: four of our associates have been recognized as 2018 Five Star Wealth Managers. 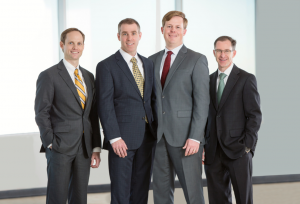 Adam Bronson, CFA®, Whitney Magers, CFP®, Tyler, Ozanne, CFP®, and Christopher Sorrow, CFA®, MBA, received the 2018 Dallas-Fort Worth Five Star Professional Wealth Manager Award and will be featured in Texas Monthly magazine, along with other award winners, in recognition for their service and dedication to clients. Five Star Professional partnered with Texas Monthly to identify an outstanding group of wealth managers who provide quality services to their clients. Award winners were chosen based on a rigorous, multi-faceted research methodology which includes ten objective criteria as well as input from peers and regulatory authorities. Five Star Wealth Manager Award candidates undergo a compliance review and do not pay a fee to be considered or placed on the final list. Several of our advisors are multiple year award winners. This is the fourth time for Adam Bronson to earn this prominent distinction. Whitney Magers is receiving this award a third year, and Christopher Sorrow is being recognized a ninth time. The Five Star Wealth Manager program is the largest and most widely published wealth manager award program in North America. We hope you will join us in congratulating Adam, Whitney, Tyler, and Chris for their accolade.